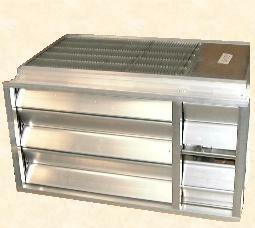 Heat recovery for energy efficient systems is available in the form of fixed cross over plate Recuperators constructed from Plastic, Aluminium or stainless steel depending on the preferred or most appropriate material specification. Ideally suited to applications with close proximity supply and extract air paths, Recuperators provide an opportunity to reclaim a minimum of 73% of normally wasted energy during the winter depending on volumetric ratios and input & discharge air temperatures. Full fresh air applications, as found in many healthcare, leisure and places of large public gathering can benefit considerably by this simple low maintenance method of energy saving that can also help to reduce the cooling requirements during periods of high summer ambient conditions. Manual or motorised face and bypass dampers can be fitted as an optional extra to provide better means of energy control throughout the year. 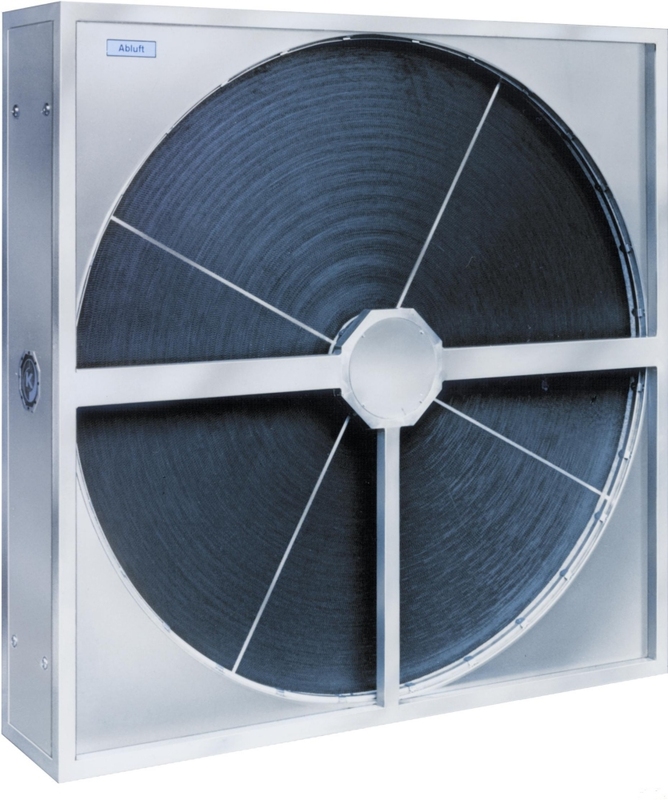 Thermal wheels are rotating heat exchangers that can be used to recover both sensible and latent heat from exhaust air when both the supply air and exhaust air paths are located adjacent to each other, as for instance in a combined supply & extract air handling unit. With the ability to transfer heat directly from one air path to the other including latent heat from condensed moisture content within the exhaust air, enthalpy recovery can normally achieve a minimum of 73% efficiency. The thermal wheel consists of an aluminium honeycomb matrix that is slowly rotated within both air streams picking up heat and transferring the heat energy from one air path to another. For this reason the use of a thermal wheel should only be applied to systems that do not rely on total separation of both air paths since some slight leakage will usually occur. Run-around coils can provide heat recovery solutions in situations where the system supply & extract air paths are not conveniently located close to each other or in applications where it is essential to ensure against possible cross contamination of air paths, such as in certain healthcare and process installations. Run-around coils are manufactured to the same specifications as for normal heater & cooler batteries and selections can normally provide a minimum of 68% (optimum) thermal efficiency, depending on volumetric ratios and air temperatures. When used as the sole means of fresh air pre-heat, the system medium will need to include an appropriate glycol solution of the required percentage to protect against possible frost damage in severe winter conditions.